As a follow up to my previous post on what macronutrients/calories are, I find it fitting to also explain how to calculate them for yourself! So, if you haven’t already, go ahead and read my last post so you can understand how it all works. The better you understand it, the more successful you will be carrying it out. Calculating calories based on current bodyweight, activity level and goals. For example, I would consider myself moderately active (exercising 4-7times a week) and my goals right now are maintenance. So, I would multiply 135×14 which = 1890 (Lets just say 1900). If I multiplied by 16, it would be 2160. Obviously, this is a pretty large difference. My recommendation is go with something in between the two, follow that for two weeks and assess from there. If you are gaining weight or maintaining while your goal is weight loss, then lower your calories and visa versa. BUT MAKE SURE YOU TRULY FOLLOW IT FOR AT LEAST TWO WEEKS. This means hitting your calories/macros every day for 14 days. GOOD weight loss means losing 1lbs per week, so if you’ve only lost 2 pounds in 2 weeks that is GREAT, keep working hard and staying consistent. A large part of determining macronutrient breakdown (how much protein, carbs and fat you need) revolves around body type. There are three predominant body types: ecotomorphs, endomorphs and mesomorphs. Ectomorphs: Naturally thin, usually have long, skinny limbs. Each type requires unique macronutrient needs. For example, ectomorphs tend to function better with a higher calories and carbs. Their metabolisms are naturally fast, needing more fuel. Here is a chart from my nutrition certification text book. Now, many people may be a hybrid of the two, naturally or altered because of their lifestyle. Choose where you best fit. I personally fit mostly under the mesomorphic type, so from my 1900 calories established above %30 will be from protein %40 will be from carbs and %30 from fat. Now that you have established you calorie needs and macronutrient breakdown, its time to put those percentages into numbers. Lets start with protein. Again I will use myself as an example and you can plug in your numbers as fit. Now that we know I will need 570 calories from protein, we need to figure out how many grams that is. Because protein contains 4 calories per gram, I will simply divide 570/4, which = 142.5. So, I should be getting 140ish grams of protein each day. On to carbs. As we established, I am supposed to be getting 40% from carbs. So, 1900x.40= 760 calories from carbs. Since carbs have the same amount of calories per gram as protein (4), I will divide 760/4 which = 190. So, I should be getting 190g of carbs per day. Lastly, figuring out fat. I need to be getting %30 of my calories from fat. So, 1900x.30 is 570. This is the same as protein but here is when it changes. Unlike protein and carbs, fat has 9 calories per gram so the next equation will be 570/9 which = 63.3. So I should be getting 63g of fat per day. Below are the two equations I used to achieve these numbers. For blogging purposes these are very general concepts. When working with clients I use these calorie/macro calculating guidelines and tweak them based on more specific client stats, lifestyle factors and goals. However, I believe using these guidelines can help you tremendously in visualizing how much you should be eating to reach your goals, obtain optimal health. This is where tracking and label reading come into play. Now that you know how much protein, carbs and fat you need each day, how do you keep track of that? 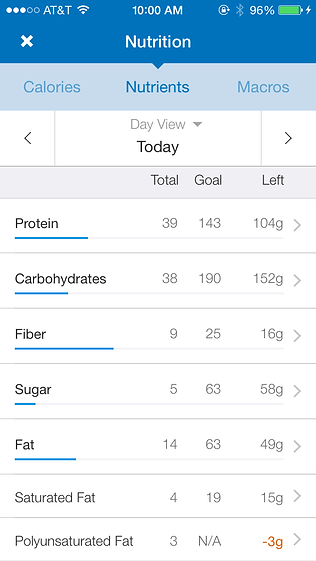 Before I begin, I want to stress the importance of tracking your macros if you have specific fitness/weightloss goals. Not forever but at least temporarily. This way, you can SEE exactly what you need to be eating each day to reach your goals. For people with less specific goals, I recommend you track your macronutrients for at least a week and then use rough estimates ‘eyeballing’ once you get a feel for what and how much you should be eating. Back to how to keep track of what you are eating. There are a couple of options. 1. The old fashioned way. Weigh your food (I highly recommend purchasing a food scale-they are cheap and can be found on Amazon for less than $15 click here to see options ) and write down the macros for that food and do that for everything you eat and drink. The only problem with this method is it ends up being a lot of math (simple math though) at the end of the day. If you chose to go this route, be proactive with it and add the total calories for each meal as they come. For example. say for a snack I have a greek yogurt, banana and almonds. Some people will plan this all at the beginning of the day or the day before, some will track as they go. If you have never tracked macros before I suggest you begin with planning it ahead of time. This way you wont run out of macros/calories OR have a ton left at the end of the day. The more you get used to it, the more you’ll be comfortable and better at tracking as you go. Below is a video I made about how to build a meal plan based on your macros! 2.The new school way. 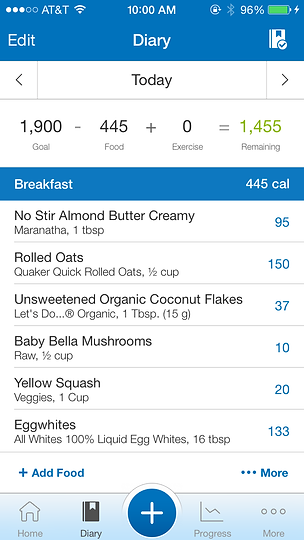 Weigh your food and log it into myfitnesspal. This is an app you can download on your phone (there are many others, this is just the one I have used for years). I recommend you DON’T go by the macros they set for you. Do the necessary set up and change them to the closest you can get to the ones you calculate for yourself. You really don’t need to set anything at all because it tells you how much you have consumed, so if you can simply keep your daily numbers to reach in your head and know how to read, you’ll be all set. As you can see I was able to set my goals pretty close to what I calculated here. Image one is an example of what it looks like when a meal is logged. At the top it gives you your calorie goal, how much you have consumed and how much you have left. The second image shows you how many of each macronutrient you have consumed, your goal and how much you have left. This also shows fiber, sugar, different types of fat. If you are eating mostly whole foods (and a variety of them), you shouldn’t have to pay attention to those numbers, just protein, carbs and fat. The last image shows the set up screen where you can plug in your calories and percentages. Just get the closest you can. Some may look at this label and think its great there’s only 50 calories in this powerade. If you look closely there are FOUR servings in this bottle. So really, there are 200 calories and 56 grams of sugar, yikes. •It’s okay to have more than one serving of something just make sure you log it properly. Serving sizes are based on the percent daily value, which is worthless in my opinion because everyone’s energy needs are unique. 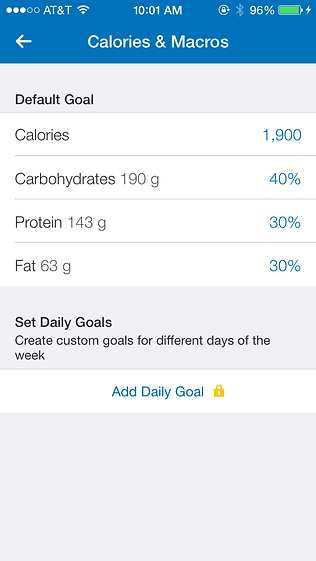 When you click on a food in myfitnesspal, you have the option to choose how many servings you are consuming. •Nutrition info for meat is for BEFORE it is cooked. For example. 4oz beef will become 3oz of beef when cooked. So if you measure cooked beef that is 3oz, log it as 4oz unless it specifies COOKED in myfitnesspal / preferred tracking device. •Same with pasta. The nutrition info is listed for when its dry, so measure before you prepare it. •Count macros NOT calories (by counting your macros, you’re essentially counting calories anyway). At the end of the day, calories in vs calories out will determine your weight loss or gain BUT where the calories are coming from (protein, carbs and fat) will determine your body composition. Lean and mean vs skinny fat for example. Left is a picture of me when I was counting calories. Right is a picture of when I was counting macros. 1800 calories in both, on the right I was consuming the proper amount of protein, carbs and fat. On the left most of my calories were coming from carbs and fat from what I remember. •Sometimes you’ll have to do a little research/planning ahead to find nutrition facts for certain items. Fresh fruit for example doesn’t come with a label, neither does a dish you order at a restaurant. Luckily, there is the internet. Many restaurants post their nutrition facts online making it easy to choose a good option. Also, myfitnesspal has a HUGE database and chances are you can find many restaurant meals already entered for easy logging. Fruit and veggies? Google and also guaranteed in the myfitnesspal database. The list goes on and on. Thank you internet.